Boxer Rocky Marciano held the heavyweight boxing title for four years during the 1950s. He is the only boxing champion to ever retire undefeated. Rocky Marciano was born Rocco Francis Marchegiano on September 1, 1923, in Brockton, Massachusetts. His father, Pierino, worked at a shoe factory. His mother's name was Pasqualena. Rocky would spend much of his life making sure she would not live in the poverty he had known growing up. He worked many different jobs to help his family, including as a dishwasher, in a candy factory, as a gardener, and in a shoe factory. As a youngster Rocky played baseball and football and dreamed of a professional career in one of those sports. He got into many fights when he thought he or his friends had been insulted, but he did not take up boxing until after 1943, when he was drafted into the army. He took the sport up because it helped him avoid "KP" ("kitchen police," soldiers who assisted the cooks) and other less desirable activities. He showed a natural ability and fought as an amateur following his discharge from the army in 1946. He won twenty-seven of his thirty fights. In 1947 Marciano had a chance to fulfill his dream of being a baseball player. He was given a tryout with the Chicago Cubs as a catcher. He did not make the team, because he could not accurately throw from home plate to second base due to an arm injury he received in the army. It was the end of his baseball dreams. The following year he turned professional in the boxing ring. By the spring of 1949 Marciano's boxing skills had received attention, after he knocked out his first sixteen opponents. The people he fought were not up to his level, but he learned much about the sport during this period. The quality of his opponents improved over the latter half of 1949 and 1950. Marciano continued to beat all opponents, knocking out most of them. There were those who thought not much good would come from the 190-pound heavyweight from Brockton in the early days. Goody Petronelli, who was a famous fight trainer, saw one of Marciano's early fights. In a story for Sports Illustrated he said, "I never thought he'd make it. He was too old, almost twenty-five. He was too short, he was too light. He had no reach. Rough and tough, but no finesse [refinement]." The hometown folks believed in him, though. They traveled in groups to Marciano's fights in nearby Providence, Rhode Island, and yelled "Timmmmberrr" when Rocky had an opponent ready to go down. Charley Goldman was the trainer who taught Marciano his trademark technique, which would serve him well as champion. Marciano was shorter than many of his opponents and his arms were not as long. Goldman taught him to use these characteristics to his advantage. He told him to make himself smaller by bending his knees almost into a deep knee squat. This gave his opponents less targets on his body to hit. He learned to punch from that position, coming straight up almost from the floor with amazing power. Even with what seemed like a physical disadvantage, because of his training and will to win, Marciano turned out to be one of the best-conditioned athletes in sports. cried in Louis's dressing room after the fight. 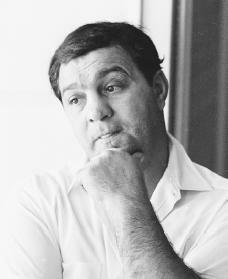 The fight established Marciano as one of the most famous fighters in the heavyweight division, and assured him of a chance to box for the title before too long. After another five fights he got the chance to go for the title. Jersey Joe Walcott was the defending champion and Marciano was the challenger when the pair met in Philadelphia on September 23, 1952. Marciano won a victory that is remembered as typical of his tough-guy, never-say-die style. Marciano was behind on points and struggling all night. He would not give up and finally caught Walcott with a short, overhand right to the jaw in the thirteenth round. Walcott was knocked unconscious and Marciano won the championship belt. Marciano defended his title only six times, but some of those fights are considered classics by boxing fans. He knocked out Walcott in the first round of their rematch in 1953. He then knocked out challenger Roland La Starza later that year. Marciano won a decision against Ezzard Charles in 1954. He almost lost his title in their rematch later that year. In the sixth round Charles cut Marciano's nose so badly that his cornermen (the people who Marciano had in his corner of the ring) could not stop the bleeding. The ring doctor watched the cut closely and considered stopping the fight, but Marciano came back forcefully against Charles in the eighth round and knocked him out. Marciano defended his title against Don Cockell in 1955 by a knockout. It was later learned that organized crime tried to get him to throw the fight. Marciano's last fight was September 21, 1955, the third time he defended his title in Yankee Stadium. He knocked out Archie Moore in the ninth round. Over four hundred thousand North American viewers watched the bout on closed-circuit television. On April 27, 1956, Marciano retired from boxing. He was thirty-one. "I thought it was a mistake when Joe Louis tried a comeback," he told the New York Times in an interview. "No man can say what he will do in the future, but barring poverty, the ring has seen the last of me. I am comfortably fixed, and I am not afraid of the future." He said he wanted to spend more time with his family. Some people have said that he also was upset because he had to pay half of his earnings to his manager. After Marciano retired he made money from personal appearances. He was frugal (very careful with money). He preferred getting rides from friends who had private planes, even though he could usually be given paid transportation to and from any of his personal appearances. On August 31, 1969, the day before his forty-sixth birthday, he died in a private-plane crash near Des Moines, Iowa. He was survived by his wife of nineteen years, Barbara, and his two children, Rocco Kevin and Mary Anne. Marciano was never among the top boxers of all time in terms of skill, speed, or power, but he knew how to use the skills he had developed and his fans recognized his grit. One sportswriter commented that if all the heavyweight champions of all time were locked together in a room, Marciano would be the one to walk out. Skehan, Everett M. Rocky Marciano: The Biography of a First Son. Boston: Houghton Mifflin, 1977. Sullivan, Russell. Rocky Marciano: The Rock of His Times. Urbana: University of Illinois Press, 2002.